We’d love your help. Let us know what’s wrong with this preview of Breakout Nations by Ruchir Sharma. To identify the economic stars of the future we should abandon the habit of extrapolating from the recent past and lumping wildly diverse countries together. We need to remember that sustained economic success is a rare phenomenon. As an era of easy money and easy growth comes to a close, China in particular will cool down. Other major players including Brazil, Russia, and To identify the economic stars of the future we should abandon the habit of extrapolating from the recent past and lumping wildly diverse countries together. We need to remember that sustained economic success is a rare phenomenon. As an era of easy money and easy growth comes to a close, China in particular will cool down. Other major players including Brazil, Russia, and India face their own daunting challenges and inflated expectations. The new "breakout nations" will probably spring from the margins, even from the shadows. Ruchir Sharma, one of the world’s largest investors in emerging markets for Morgan Stanley, here identifies which are most likely to leap ahead and why. After two decades spent traveling the globe tracking the progress of developing countries, Sharma has produced a book full of surprises: why the overpriced cocktails in Rio are a sign of revival in Detroit; how the threat of the "population bomb" came to be seen as a competitive advantage; how an industrial revolution in Asia is redefining what manufacturing can do for a modern economy; and how the coming shakeout in the big emerging markets could shift the spotlight back to the West, especially American technology and German manufacturing. To ask other readers questions about Breakout Nations, please sign up. Due to tremendous hype about this book, I read it but I was surprised that it is nothing but some random notes on various economies of the world. The stories /case studies or concepts mentioned in the book are almost outdated. Anyone who reads a newspaper daily will find this book as a nothing but the bits and pieces collected from the leisurely articles on economics written to fill the boringness of a Sunday. The chapters on China, India, Russia and Brazil are lack depth and these are totally ou Due to tremendous hype about this book, I read it but I was surprised that it is nothing but some random notes on various economies of the world. The chapters on China, India, Russia and Brazil are lack depth and these are totally outdated. The author says that Brazil cannot grow because the cities are conjested and the it doesn't invest in infrastructure. The writer seems to neglect the geographical and the climatic conditions of Brazil. How can a nation have cemented roads all the year long in the middle of Amazonian forest? Secondly, almost 90% of the country's economic activity is contained in the region around Rio and Sau Paulo and these are very well connected. If the restaurants in Sau Paulo are costlier than those in Paris, then it doesn't mean that the economy of Brazil is in danger. With a per capital income of USD 12000.00/- in Brazil, the author feels that it should not focus to be a welfare state but it should built better roads. Then when should a country focus on Education and the Medical needs of its people? Brazil started investing in welfare when the per capital increased from USD 2000.00/- to 12000.00/-. Does it still need to wait? The author feels that the Brazilian real is overvalued due to which its exports have suffered. But Brazil still continues to be the largest exporter of Iron Ore.
Brazil accounts for 25% of global exports of raw cane and refined sugar, it is the world leader in soybean exports and is responsible for 80% of the planet’s orange juice. Large iron and manganese reserves are important sources of industrial raw materials and export earnings. Brazil doesn't import the oil it consumes; it has halved its domestic debt through exchange rate-linked certificates and has seen exports grow, on average, by 20% a year. The exchange rate does not put pressure on the industrial sector or inflation (at 4% a year), and does away with the possibility of a liquidity crisis. As a result, the country, after 12 years, has achieved a positive balance in the accounts which measure exports/imports, plus interest payments, services and overseas payment. Thus, respected economists say that the country won't be deeply affected by the current world economic crisis. "When Petrobras is worth more than Turkey, there's something wrong." Then what would he say for the country that has companies such as Microsoft,Apple or CocaCola whose assets are worth more than many European countries put together? Such comparisions are driving an informed reader, insane. If China builts a magnetic train from the middle of Shanghai to the airport and if the train is not overcrowded, it doesn't mean that China has made a wrong investment in infrastructure. Author mentions that China is today, what Japan was in 1970s. He neglects the size of two countries and also neglects that fact that Japan was never cheap in technological products but China was able to deliver cheap tech. products. Japan never invested in the African countries but China has. 2) 'Almost' all the unemployed or underemployed villagers of China have migrated to the cities. New manpower is not available as freely as earlier. (Check my emphasis on the word 'Almost'). Due to the migration of villagers into the cities, the housing price in the cities have gone up very high. Now, just consider, how can an upmarket residential price go up because of the labourers? Does he mean to say that the laborers have converted the upmarket areas into slums and that the rich doesn't have space to live? 3) China will not have enough manpower due to declined population growth. This is partially true because Chinese economny is export oriented and it must keep the production cost low. But who has prevented China to employ the people from Mongolia? Secondly, lot of Chinese industries have already started migrating to Vietnam, Combodia and even Africa. Author has totally forgotten this fact. If Japan, USA or UK can set up manufacturing facilities in China, then why can't China set up manufacturing facilities in Vietnam, Combodia, Burma or Africa? Has any nation prevented it from doing this? 4) The laborers in China demand more than earlier because all the laborers are already occupied. Isn't this a world-wide phenomenon? This happens everywhere. Why single out China? Agreed, that there is a regional market in India but that doesn't mean that the global brands do well only on certain big cities in India. KFC or Mc Donalds make profit in every Indian city. Parle G is sold everywhere from Kashmir to Kanyakumari and Samsung Mobile is the No. 1 mobile brand in every district and state. It is surprising that the author has linked the local politics to influence the choice of people over commodities. The consumer tastes of India cannot be as homogenous as other countries but the global brands have same acceptance everywhere in India. The Indian GDP is USD 1400.00/- but is the figure real? Even a child in India knows that there is more undocumented money in India than on the Govt. records. If you closely study the GDP of Indian states, you will find a comparable growth. If Bihar grows at 11% it doesn't mean that North India is emerging better than South India. Look at the per capita of Bihar. How can he say that Bihar and UP offers better economic possibilities than Tamilnadu which already has a high per capital with a steady growth rate. It is easier grow when the base is very low compared to a higher base. The author is not very optimistic about Russia either. The author says - Russia is an oil state that has lost its way. Boris Yeltsin was drinking hard and firing top ministers during 90s and running a national debt. One of the biggest failures of Yeltsin was privatization of state industries. Investing in an industry is a long term process. The good result that Putin achieved was because Yeltsin initiated the privatisation. You cannot expect overnight profits in any business. Central and local government expenditures are about equal in Russia. Combined they come to about 38% of GDP. Fiscal policy has been very disciplined since the 1998 debt crisis. The overall budget surplus for 2001 was 2.4% of GDP, allowing for the first time in history for the next year's budget to be calculated with a surplus (1.63% of GDP). Much of this growth, which exceeded most expectations for the third consecutive year, was driven by consumption demand. Analysts remain skeptical that high rates of economic growth will continue, particularly since Russia's planned budgets through 2005 assume that oil prices will steadily increase. Low oil prices would mean that the Russian economy would not achieve its projected growth. However, high oil prices also would have negative economic effects, as they would cause the ruble to continue to appreciate and make Russian exports less competitive. The 2007 budget law incorporates a 25% increase in spending, much of it for public-sector salary increases, pension increases and social work. Spending on education is targeted to increase by 60%, based on 2006 legislation, and spending on healthcare is to increase by 30%. Funding for the four "national projects", undertakings in agriculture, education, housing and healthcare, will increase by 85 billion roubles over the 2006 figure to 230 billion rubles. After reading this book, I felt like reading random articles based on half baked research. It was a gross disappointment for me. Published in 2012, I picked up the book five years late. This is an extremely well-researched book, giving a general background and in-depth analysis of developing or under-developed economies of the world. Ruchir Sharma is a wealth manager and the chief of one of the biggest fund houses in the world. He has given a first hand account of the economic situation prevalent in select list of countries which he thinks will emerge as winners or losers in the long run over the next decade. Each chapter Published in 2012, I picked up the book five years late. This is an extremely well-researched book, giving a general background and in-depth analysis of developing or under-developed economies of the world. Ruchir Sharma is a wealth manager and the chief of one of the biggest fund houses in the world. He has given a first hand account of the economic situation prevalent in select list of countries which he thinks will emerge as winners or losers in the long run over the next decade. Each chapter is about a country and he delves deep into the problems or the plus points of the economy of each of these. The language is easy to understand without too many economic jargons and any layman would be able to soak in the facts provided. It is also interspersed with some trivia which makes it interesting to read. For e.g., how many of you know that Saudi Arabia imports refined petroleum or diesel as it does not have refining capacity to refine its oil produce although it is the largest exporter of crude oil. Or local glass manufacturers in the Gulf region have to import sand, a key raw material for making glass, although the countries are surrounded by sand all around. Apparently, the sand quality is too poor to manufacture glass so they have to import high quality sand from other countries. I had started this book with a high expectation. I thought that the book would provide some great insights about the emerging economies and was expecting an analysis of the BRICS nations (Brazil-Russia-India-China-South Africa) but the book contains short articles on countries across the world-from countries in Eastern Europe (Poland, Hungary) to countries in Africa (Nigeria) in addition to the Brics Nations. The author has discussed the merits and demerits of the country and focused on their res I had started this book with a high expectation. I thought that the book would provide some great insights about the emerging economies and was expecting an analysis of the BRICS nations (Brazil-Russia-India-China-South Africa) but the book contains short articles on countries across the world-from countries in Eastern Europe (Poland, Hungary) to countries in Africa (Nigeria) in addition to the Brics Nations. The author has discussed the merits and demerits of the country and focused on their respective cultures, governments, demographcs, economy, political stability and also factors such as corruption and crony capitalism. The articles were fun to read and learnt some interesting facts from them, but no real insights came out. I felt that the article on India could have included a lot more about the aspirations of the country's youth etc. and there was no need to focus on the crime problems in a particular state. Since I have no or at best very little idea about the other nations, I can't say if his observations are superficial or not. This book just won the prestigious Tata Literature First Book Award yesterday (November 4, 2012). The authors shortlisted for this award included Nilanjana Roy (The Wildings), Sudha Shah (The King in Exile), Sudheendra Kulkarni (Music of the Spinning Wheel), Naresh Fernandes (Mahal Foxtrot), Ruchir Sharma (Breakout Nations) and Aman Sethi (A Free Man). \Germinating from his experiences of having spent one week each month in emerging markets for the past 15 years, “Breakout Nations” takes a penetr This book just won the prestigious Tata Literature First Book Award yesterday (November 4, 2012). The authors shortlisted for this award included Nilanjana Roy (The Wildings), Sudha Shah (The King in Exile), Sudheendra Kulkarni (Music of the Spinning Wheel), Naresh Fernandes (Mahal Foxtrot), Ruchir Sharma (Breakout Nations) and Aman Sethi (A Free Man). \Germinating from his experiences of having spent one week each month in emerging markets for the past 15 years, “Breakout Nations” takes a penetrating look at the countries he believes are likely to flourish, or fail, in the years ahead. The book gives a clear picture of the shifting balance of global economic power and how it will play out for emerging nations and the West. Ever wished that you were there at the beginning of... IBM, Apple, Google, Twitter, green technology ect... This book helps you look ahead and gives you informative speculation on the next BRIC emerging market. Worthy read, and easy to understand from the novice to the ubber economist or the savy investor. It is a reality check on the euphoria that surrounds the emerging economies. Extremely well articulated and written in simple language even to make sense to those that do not understand the nuances of economic development. What it reveals about countries like China and India is nothing new but is presented in a manner that it appears to be convincing. Only time will tell whether what has been predicted will come true but the book makes a very interesting reading. Economics has always possessed that characteristic indigestible and toxic charm which renders the study or dissection of any topic, even remotely associated with it, an intensely grey-cell-intensive expedition. This is where Ruchir Sharma’s book barges in through the gates of the mighty impenetrable bastion and brings with it a deluge of fresh air. The very first element that catches the reader’s attention is the ingenious and yet simple compartmentalization of different countries and geographic Economics has always possessed that characteristic indigestible and toxic charm which renders the study or dissection of any topic, even remotely associated with it, an intensely grey-cell-intensive expedition. This is where Ruchir Sharma’s book barges in through the gates of the mighty impenetrable bastion and brings with it a deluge of fresh air. The very first element that catches the reader’s attention is the ingenious and yet simple compartmentalization of different countries and geographical regions into independent and distinct chapters. This breaks down the seemingly convoluted concepts of economics into understandable and soluble pieces or nuggets. Each chapter delves into the economic situation of a particular country or a geographical region. The current economic situation when coupled with the past, the predictable future, political events and bigwigs, cultural mindsets and other good and not-so-good elements makes for a heady concoction. In that vein, each chapter can be likened to a short story narrated from the third person’s perspective by a master story-teller. To extend the viewpoint, the book, itself, is synonymous to a collection of short stories where each story is equally engrossing and unique. The book is an ode to the emerging or breakout nations of the immediate future, nations that are going to stride ahead in terms of development and stability and stand out as role models for the other nations of the world. Through logic and reasoning, it scrutinizes certain economies and gives a verdict on whether that particular nation is poised to grow or fall in the coming years. Sharma starts off with the big giant, namely China. According to him, the wonderful stories revolving around China’s gargantuan growth in the future are over-estimations of the real scenario. Its growth rate is poised to slow down alongside the negative factor of an aging population. Inflation is also a major factor that will play spoilsport to the long term meteoric growth story that is projected now. Soon after the hype about China is busted, Sharma goes on to tackle the Indian conundrum. The most hard-hitting fact that comes across in the chapter concerning India is that the ‘demographic dividend’ factor is highly overrated. Besides this, poor infrastructure, corruption, policy paralysis and inflation are serious hurdles that are going to stem the apparent steaming ahead of India into the developed world. Through the examples of Mexico and Russia, Sharma highlights the destructive effects of oligarchic nations. The infrastructure in Brazil has degraded to such an extreme level that CEOs are compelled to use helicopters for commuting from one location to another. As for the disaster story of the Eurozone, he points out that all is not doom through the examples of Poland and the Czech Republic. He also talks about the grey area of the world aka The Fourth World which is represented by countries such as the African nations, Sri Lanka, Vietnam and the others. Although the future trajectory of these nations cannot be determined in any particular manner because of the varied volatile factors governing the economic and political machineries of the nations, Sharma throws in delectable pieces of logic supported by facts which hints at the possible demise or growth of certain countries. The two countries that stand tall by the time the reader has completed the journey called Breakout Nations are South Korea and Turkey. While South Korea is flexible and dynamic enough to churn out world-class Asian brands, Turkey is headed by one of the most charismatic leaders of our times. The book, in itself, is a beautiful odyssey that is characterized by an in-depth knowledge about the machinations of different nations around the world. Sharma’s genius comes to light through the manner in which he has effortlessly and quite simply put forward the complex logical theories governing the economic future of the nations. This book is highly recommended for people who wish to come to terms with the current global economic situation as the book helps the reader to compare, dissect, analyze and judge economic theories and deductions in a much simpler and digestible manner. It is hard to escape popular economic discussions without hearing the name BRIC and developing nations. The very name - BRIC, like brick, suggests that these four nations are monolithic and identical in their intentions and progress of growth and development. This could not be more false. The author, head of Emerging Market Equities at Morgan Stanley, offers brief vignettes of some developing nations, using both statistics, policy analyses, and an intuitive sense of what nations develop and which It is hard to escape popular economic discussions without hearing the name BRIC and developing nations. The very name - BRIC, like brick, suggests that these four nations are monolithic and identical in their intentions and progress of growth and development. This could not be more false. The author, head of Emerging Market Equities at Morgan Stanley, offers brief vignettes of some developing nations, using both statistics, policy analyses, and an intuitive sense of what nations develop and which ones don't. -China's meteoric growth is due for a slowdown. Perhaps from 7-10% per annum to 3-5%. Much of the eligible rural population has moved to the cities, and they are moving from a commodity-import economy to a manufactured-goods exchange economy, more on equal footing with the US, and an attempt to develop home-grown sectors. -India's growth remains unsteady due to the widely varying quality of its infrastructure. The massive population pool may be a boon, but it must be necessary to safeguard against deficit spending and crony capitalism. -Brazil is another separate case entirely. The cost of living is too high for the developing economy, and the government - with only 4% growth - has invested in social welfare without complementary increases in infrastructure. Even small-scale growth could overwhelm transportation without this necessary increase. -Mexico is dominated by an oligarchy and a relatively stagnant government. Most Mexicans would rather leave than press for change. -Russia is contradictory. The per capita income has risen to $13,000, but there is fear of power outages. They have perhaps the worst aging demographic in the Western World. They had astonishing growth in the early 2000s due to oil prices, but the economy shrank by 10% in the crash. Only India and Egypt had higher inflation - another difficulty which should not happen in a slow recovery. Russia's only major international industries are oil and gas, and it needs to diversify. -The sweet spots of Europe are Poland (which has recovered remarkably well), the Czech Republic, and the Baltic states, which have grown the best in the post-Warsaw Pact era. Some nations like Romania and to a greater extent, Greece, have jack-knifed, but these are doing quite well. -Turkey is one of the more promising countries in the Middle East. -Indonesia is one of the rare cases of a diverse commodity economy. The Philippines has potential, if it began to dismantle the oligopolies. South Korea is rapidly rising and well, and may yet become 'the Germany of East Asia', being secure, well-educated, and diverse across a wide variety of sectors. -Cases like Nigeria show that even one good policy or investment technology opportunity can lead to a mini-boom. Life changing book it was!! Guys I generally say this at the end that how fruitful will it be for you to read this blah blah. But I couldn't help but to start with this as I don't want to prove it to you how good a book this is. I just want to declare this and you can take my word, once you are through, even you won't ask for proof. This is the second book I've read of Mr Ruchir Sharma and that completes both the books written by him. I would suggest that the books should be read in sequence as Life changing book it was!! Guys I generally say this at the end that how fruitful will it be for you to read this blah blah. But I couldn't help but to start with this as I don't want to prove it to you how good a book this is. I just want to declare this and you can take my word, once you are through, even you won't ask for proof. This is the second book I've read of Mr Ruchir Sharma and that completes both the books written by him. I would suggest that the books should be read in sequence as the stories are inter woven and even though some might argue that the books do not form a series, I beg to differ. Stories in both the books tell a similar story but differ in the their depiction. Breakout Nations is plain and simple, it tells the whole story about a country(or a particular region like Europe, Gulf) and by story I mean the economic history, present economic scenario and future economic prospects. Chapters in this book are chronological anecdotes of countries sifted through a professional eye whereas in The Rise and Fall of Nations, a ten-rule commandment has been created which becomes a tool to judge a country based on how do they perform on each of the 10 parameters. 1) USA: They thought the "slowdown" can be left behind if they take the "credit train" but "income stagnation and low demand" ticket collectors beg to differ. 2) China: Everyone's favorite, but they are suffering from structural inflation which itself conveys the idea that it doesn't have a bottom less pit of cheap labor anymore. Renminbi is appreciating which means their cheap exports are losing their sheen. And many such examples are there but let's not get ahead of ourselves. I apologize in advance as I cannot cut short the length of this review and rob it off its flavor. You will thank me later. In the 21st century, Brazil has ridden the tide of commodity boom as high demand from china has fuelled the commodity economies and concomitantly appreciating the value of their respective currencies. Brazilian Real got so strong that people with money in Brazil started importing expensive products from USA like cars, yachts, watches which clearly cannot be the requirement of a nation which doesn't even has its basic infrastructure at place. When a developing nation starts feeling expensive to a developed nation citizen, most probably that nation will not be the successful nation in coming time. A vicious circle was formed between commodity exports and downslide of the economy. If you are digging out something from the Earth and making money by selling it then that source of income is not sustainable. Piling on mistakes they didn't even invest their commodity export profits into building roads, ports, education, developing manufacturing facilities etc. This led to the decrement in the competitiveness of their manufactured exports as they started to appear very expensive because of overvalued Real. So, in order to sustain their living conditions they had to become more and more dependent on commodity exports which are up and running as long as there's demand in China. But since China's GDP growth rate has been at a record low lately, Brazil is looking at tough times ahead. Brazilian economic history has been topsy-turvy mainly because of its old nemesis, inflation. It all started with the building of Brasilia, their national capital. Since they didn't have the requisite amount to build it so they made ends meet by printing the notes which led to hyperinflation(Inflation rates going as high as 2100%). Every government which came and went between 1980-1994 had only one quiver in their arrow Once the currency loses its purchasing power, the incumbent government would freeze the accounts and will issue a new currency. The above mentioned period saw rise and fall of 5 Brazilian currencies until in 1994, President Itamar Fanco came and put an end to all this by bringing in the currency Brazilian Real. It's a funny story of how they actually brought in the Real and I would recommend you all to go through it once. A lot of blame for inflation can also be given to lack of investments by the government in basic infrastructure which led to untenable prices. For instance, public transport of Brazil has sunk to such low levels that across the city, corporate heads use private helicopters to move from one headquarters to another. Condition of roads are so poor that the price of getting the goods from the site to port is more than shipping it from port of Sao Paulo to China. So this establishes an inherent fear Brazilians have against inflation and the logical follow up is to increase the interest rates so that it remains in control. But since Brazil has a unique situation of Trilemma, this move fails every time and ironically, inflation indirectly gets increased due to this move. How? Let's see. This problem is similar to honey applied to your burn and the bees are after you. In order to curb the inflation, interest rate increment is the logical step. But increasing the benchmark rates will lead to higher interest rates charged to lenders as well as paid to depositors and this will attract the foreign investors as the average payout by this emerging nation is much higher than its peers. Thus, Brazil has suffered an incontrollable inflow of foreign money which appreciates the currency encouraging imports and discouraging exports( I hope you are seeing how the dots of Brazil's Bermuda Triangle are connecting). If the outflow of this foreign money would have been made into productive avenues like importing machineries to promote manufacturing, buying IPRs to encourage a new business avenue, then it could've been said that Brazil turned its predicament into an opportunity. But as I mentioned earlier that this money was used to import useless items which the country didn't need. This is the whole trilemma guys and trust it me it was so much worth the effort that went into understanding this. This is the level of explanation that has gone into the book and that too I've explained about only this one country. You will get to know about China, India, Russia, Europe, Gulf countries, Asian Tigers in short the whole world and anyone who is interested in this genre, should go for it like hell. "If there's no wind for you, row"
Ruchir is a stone cold pimp. He is head of emerging markets for Morgan Stanley and speaks so clearly and with energy (He is interviewed on Bloomberg sometimes). He is very direct and doesn't muck up his explanations. I read his latest book "The Rise and Fall of Nations" and it is one of my favorites. This book proved to be a great refresher on the nations that have the necessary requirements for growth, or the recipe for failure. His second book builds on this first one and ties his thoughts tog Ruchir is a stone cold pimp. He is head of emerging markets for Morgan Stanley and speaks so clearly and with energy (He is interviewed on Bloomberg sometimes). He is very direct and doesn't muck up his explanations. I read his latest book "The Rise and Fall of Nations" and it is one of my favorites. This book proved to be a great refresher on the nations that have the necessary requirements for growth, or the recipe for failure. His second book builds on this first one and ties his thoughts together into a set of rules to analyze various economies. This book starts with BRIC and Mexico describing their economic issues, Ruchir is good at pointing out when to notice economies are not doing well and what to look for. His logic is clear and he proves his analyses by visiting the countries of interest. Based on his analyses, Poland, Czech Republic, Indonesia are setup for success. Turkey is hailed upon as a breakout nation, but recent political issues involving Erdogen may have adjusted that analysis. South Korea has been booming tremendously in comparison to Taiwan. He calls them the gold medalist among all nations. They are killing it. Taiwan has far too much reliance on Chinese labor, which is losing its cost advantage. What is extremely interesting is his discussions with local policy makers in Seoul. They have been keeping their overall debt low to prepare for the impending unification of both Koreas. They anticipate absorbing the North once their regime fails. They will inherit a wealth of natural resources and a whole new workforce ready to make a normal living. I also appreciate when he adds tidbits of advice like "rules of the road", which are succes or failure signs to watch for with emerging or frontier nations. - Rising stock prices favor the rich, rising oil prices hurt the lower income bracket. - Nations tied to commodities will experience volatility, while the US will maintain stability since they lead in worldwide software services. The theme of this book is one close to my heart - to try and identify the next big winners on the global stage. The growth stories of South Korea, Taiwan, Singapore, and (partly) China are deeply inspirational ones for anyone interested in the genesis and drivers of lasting economic success. Sharma attempts to identify the next set of winners from the current crop of emerging and frontier markets. One has to give credit to the author for identifying the temporary nature of commodity booms - this The theme of this book is one close to my heart - to try and identify the next big winners on the global stage. The growth stories of South Korea, Taiwan, Singapore, and (partly) China are deeply inspirational ones for anyone interested in the genesis and drivers of lasting economic success. Sharma attempts to identify the next set of winners from the current crop of emerging and frontier markets. One has to give credit to the author for identifying the temporary nature of commodity booms - this was back in 2011 when Brazil and Russia were in the pink of financial health. Wealth creation through rent seeking has since been identified as the bane in these countries and has come back to haunt them. The author has also been prescient about the structural factors that would reduce the breakneck growth of the Chinese economy. The structural weaknesses of the Indian economy (including population pressures, institutional weakness, and rent seeking billionaires) have been aptly pointed out. We have seen in the period since this book's publication that it has been truly hard to return India to a high growth path. A combination of the benefits of the reforms of the 90s and early noughties coupled with a general global boom made us believe that we had a God given right to enjoy high growth forever - we have since had a rude awakening. The chapters on Turkey's revival, a hint of reform in Nigeria (albeit marred by anecdotal analysis of Kabila's sincerity in Congo), and the sluggishness in Mexico make for interesting reading. However, there are some areas where the analysis in the book is superficial and excessively pro-market. The author has advocated "creative destruction" including encouraging hard landings by citing examples such as the US (1930s) and South Korea and their subsequent successes; this is contrasted with the stagnation caused by zombie banks and corporations in Japan. While downturns do provide scope for tough reforms, the above argument ignores the fact that the "hard landing" in the US caused the Great Depression which was alleviated by Roosevelt through classic Keynesian stimulus, backstops for banks, and the small matter of a World War (providing a huge impetus to manufacturing growth). Another gap is to attribute the differences between the success of east Asian economies purely to market friendly reform. While this remains a factor, the structural inputs for long term success was laid in the 1960s and 70s through massive investments in education and healthcare, wide ranging land reforms, focus on savings and investments, exposing select sectors to global competition while temporarily protecting others, and a relentless emphasis on long term competitiveness. One only has to look at South Korea which started off by exporting construction services and basic goods, followed by ships, then steel, and is now a global leader across sectors. Each of these sectors had enjoyed some stimulus benefits from the government in the early stages of evolution. Taking issue with some expenditure on welfare in emerging economies (even poorer ones in India) ignores the political economy and the need to ensure a modicum of social justice (the issue, of course, is in the corruption in countries from India to Brazil which makes a mockery of most welfare schemes). On the whole, this is a decent read but not to be absorbed in isolation from other literature on the subject. These days, we keep seeing numerous books on emerging economies at regular interval. These are mostly written by Americans. Of late, some Indians who have made it big in the United States have also jumped into the book-writing business. Morgan Stanley's top executive Ruchir Sharma's book 'Breakout Nations' stands out in this clutter of books. It is one of the most fascinating books on the world's new economies. I have come across very few guys who have original thoughts when it comes to writing These days, we keep seeing numerous books on emerging economies at regular interval. These are mostly written by Americans. Of late, some Indians who have made it big in the United States have also jumped into the book-writing business. Morgan Stanley's top executive Ruchir Sharma's book 'Breakout Nations' stands out in this clutter of books. It is one of the most fascinating books on the world's new economies. I have come across very few guys who have original thoughts when it comes to writing on world economy/developments/forecasts. This guy is definitely right up there. Let me just give an idea on the title of this book which is the basic concept. The definition of breakout nation is very modest. They are not countries that are going to become superstars but they are those who over the next three, five, possibly 10 years, which will beat expectations compared to where the consensus is, and grow faster than other countries in that league. He has gone deep into BRICS and come out with some amazing statistics but I won't talk about it here instead I will just mention the 2 countries whose name really surprised me: Czech Republic and Turkey. They are the 2 countries to watch in the next 5 years. The other amazing fact was about Qatar where the per capita income is an astounding $100,000!! The most concise, non-spin-doctored, insightful guide to the new economic landscape. Completely changed the way I look at the whole 'emerging markets' phenomenon. Predicting the next economic miracle ... this is the quest of any budding investor or follower of world economics. What is Ruchir Sharma's prediction? To be honest his answer is far less interesting than the framework and methodology he uses to follow and understand the trends and the conventional and very flawed logic and wisdom he spouts as he explains it. Take one of his claims, "The suppressed Chinese consumer is a myth" he then cites the high consumption of Rolls Royces, Louis Vutton purses, Predicting the next economic miracle ... this is the quest of any budding investor or follower of world economics. What is Ruchir Sharma's prediction? Take one of his claims, "The suppressed Chinese consumer is a myth" he then cites the high consumption of Rolls Royces, Louis Vutton purses, and other luxury products in China as counter-proof. I am appalled by the stupidity of that argument. Taking examples of both developed and developing nations, this well researched book covers how their economies are likely to shape up. Although it has become silightly outdated (publish year : 2012), still does a very good job highlighting how policymaking can be a leading indicator whether a nation is likely to breakout in the next decade. The book was written in 2011 and as the name suggests, it has made many macroeconomic predictions. Many of these predictions have been spot on. But the best thing about the book is that it links political system with the economic development. If you want to have an idea of the developing world, this is the book for you. Excellent take on emerging countries and frontier markets. The writing style is engaging and research backed information on some of the countries are eye opening. A must read for any emerging market investor. Economics ,is a fascinating study, to which i got acquainted quite late in life but it turned out to be one of those things that you instantly like(Specially Macroeconomics) and are surprised by the fact that you didn't come across them sooner. Ruchir Sharma has managed to do the impossible with Economics in this book, he has kept the brush strokes broad enough that a layman could understand and appreciate the overall picture & he has kept the same strokes fine enough in places so that an expert or enthusiast could really enjoy the process and take away some major points with them. One of the worst and best things about reading Non-fiction is that it is a SLOW process, it HAS to be, there is no other way to do it, between readings you have to stop & digress, to let it sink in,do a little side research of your own,read some history ,some present news,relate and revel in the topic entirely. And on that account Breakout nations does a bang on job, Mr. Sharma has used a LOT of research in this book, he has discussed about almost every important Nation and Area on the globe.Giving you insights and a lot to think about. This book talks about Nations and their progress towards economic marvels, specially about the emerging nations and who among them will 'Break out' as the fastest & most durable in the race towards growth and prosperity. It does so ,by systematically analyzing one emerging nation at a time. Now to the negative, the book is well researched and well written. The reasoning is logical and easy to follow but the book is now 'Outdated',it's 2017, many of the predictions and assumptions of the author didn't pan out precisely because of his initial argument,its been more than 5 years, the world dynamics has changed, 'TRUMP' leads the US ,and talks of 'Protectionism' are heard everywhere in the world, the chaos in the middle east is still to be sorted. Just because i picked up this book a bit late i couldn't give it a higher rating. But to understand the nuances and arguments of how to actually judge an economy or a breakout country more accurately, i most definitely recommend this to anyone remotely interested in economics.The process followed by Ruchir sharma is to be studied and studied well, his rules of the road noted, Politics and Economy are not as isolated as people think, how a capable leader could breakout Nigeria or inept management doom a previously bright star like Vietnam is to be really understood, one has to look at a lot of aspects and for going that distance , and explaining it in marvelous simplicity i respect the author greatly. "As much as we all love the speculative titillation of futurology, no one can forecast the next century with any credibility and, more important, be held accountable for it." This book is a breath-taking journey of the economic 'juggernauts' of the present times.Written by a reputed investor, it provides us with the insight of how the people , inside the industry, perceive the countries in which they plan to invest. Written in lucid manner, it explains why a nation can or can not ce a 'break-out' nation, an expression for nations which can project high economic growth in the foreseeable future. The author focuses on the 'emerging' nations with rules and regulation i This book is a breath-taking journey of the economic 'juggernauts' of the present times.Written by a reputed investor, it provides us with the insight of how the people , inside the industry, perceive the countries in which they plan to invest. Written in lucid manner, it explains why a nation can or can not ce a 'break-out' nation, an expression for nations which can project high economic growth in the foreseeable future. The author focuses on the 'emerging' nations with rules and regulation in place for their financial markets - like China, India, Turkey etc and the 'frontier' nations with no stringent rules for their financial institutions - like Africa, Middle East etc. The author draws similarity of the present economic conditions with those at the time of previous recessions and bubble bursts and gives the outcome in a very intriguing manner. The book is backed up with lots of data to support the author's point of view. In a nutshell, it is a must read for the enthusiasts in and out of the industry. Featuring chapters on countries like India, China, Russia, Turkey, South Africa, Mexico, Brazil, and regions like Africa, Middle East, Central Europe, South East Asia, this books lists out the varying factors at play in various developing economies. One thing that strikes out is how woeful India's per capita income is, in comparison to even these countries, and how all the talk about us being an upcoming superpower is pure hogwash. America and the developed countries make an appearance towards th Featuring chapters on countries like India, China, Russia, Turkey, South Africa, Mexico, Brazil, and regions like Africa, Middle East, Central Europe, South East Asia, this books lists out the varying factors at play in various developing economies. America and the developed countries make an appearance towards the fag end of the book. The author has great faith in America's continued economic dominance, led as it is by the Silicon valley tech giants big on innovation and handsomely aided by new incoming talents. Ruchir Sharma, incidentally, outs himself as a right winger when he prescribes the pain-medicine for recessions- "a hard landing is essential to bouncing right back up". Corporations in trouble? let them go bust, country in trouble? devalue currency and cut wages. Scanning non-fiction shelves esp on contemporary politics/economics by Indian authors scares me. A lot of them r superficial cozy-reads by journalists with minimal research and recycled material. This though is a joyride by d head of 'emerging markets' at Morgan Stanley. A sort of economics travelogue that reminded me of 'Boomerang' by Michael Lewis and 'The Quest' by Yergin. The author analyses the economy of 15-20 countries and their prospects of growth, providing needed history and culture. So Scanning non-fiction shelves esp on contemporary politics/economics by Indian authors scares me. A lot of them r superficial cozy-reads by journalists with minimal research and recycled material. This though is a joyride by d head of 'emerging markets' at Morgan Stanley. A sort of economics travelogue that reminded me of 'Boomerang' by Michael Lewis and 'The Quest' by Yergin. The author analyses the economy of 15-20 countries and their prospects of growth, providing needed history and culture. So, we know of d uneasy strict secularism of Turkey, d apartheid of South Africa, d strange case of expensive Brazil, "mafia-state" Russia and so on. The author does this without being superficial, condescending or throwing jargon and gives a deep sense of satisfaction. Also, surprisingy the book hardly had any anecdotes or conversations and yet was unputdownable. Ruchir Sharma is the master of his subject and anything he says is worth hearing whatever your view of it. I thought he knew the price of everything without necessarily its value. The book was high speed data with debatable conclusions; the kind of thing you would do in an investor's meet or a board meeting to intimidate everyone into doing exactly what you want. But that said, everyone who cares about this subject should read this book. I am glad I read it. The book is easy to read but one wonders whether it is possible to make sense of something as complex as India or Russia by visiting the country for two weeks, talking to a few people and writing a small chapter on it. For lay people with little time it makes an excellent read and gives one the feeling of being "well informed" but is this gross oversimplification? An epoch defining book. A tour de force of what makes emerging markets tick. Thought provoking and a must read for all policy makers like administrators and politicians. The author has opened our eyes to the changing equations in he world economy. 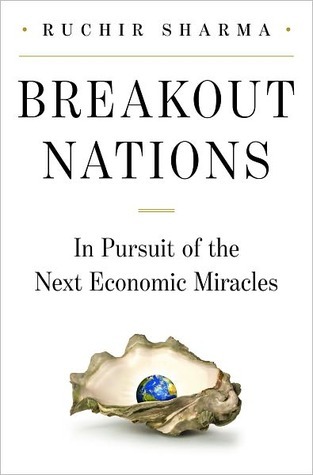 The author here has gone in pursuit of identifying nations who has the potential to become next breakaway nation. What measurable are the econmic yardsticks. How nations performed economically in post colonialism but cold war environment? What were the scenario post 1990’s when large number of nations started drifting away from orbit of communism ? What was the progress till 2008 , when the crisis threatened to derail the economic framework of the world? How some of the nation’s survived the cri The author here has gone in pursuit of identifying nations who has the potential to become next breakaway nation. What measurable are the econmic yardsticks. How nations performed economically in post colonialism but cold war environment? What were the scenario post 1990’s when large number of nations started drifting away from orbit of communism ? What was the progress till 2008 , when the crisis threatened to derail the economic framework of the world? How some of the nation’s survived the crisis and pushed forward, and rest met with horrendous outcome? What are the precepts for the economic growth? The book answers all these questions. The author picks up nations who had figured prominently in reportage , for showing economic potentials in last two decades, deliniate their performance during different time periods and dissect them to forecast, as to how future holds for them and who can ultimately turn out to be the future star. The nation which has witness astounding success and has grown at a burgeoning speed is China. The major driver has been surge in investment,which account for 40-50% of their GDP. The investment spending includes all those stuffs that lays the foundation for future growth like transportation network, telecommunication network, office building, factory machinery and so on. Add to it labour cost advantage and China has zoomed ahead. However, The cheap labour advantage is beginning to wane in China. Rising wages now is compelling manufacturers to move plants in cheaper markets like Bangladesh and Indonesia. Export booming in China has hit its limit and is beginning to reverse. East Asians nations like South Korea and Taiwan build their model based on their colonial master- Japan. They invested heavily on R&D and their economies have been witnessing decent growth for the last 5 decades. The most noteworthy is the performance of South Korea which is a home to 3 manufacturing giants - Samsung, Hyundai and LG, who have sizable presence not only in emerging nation but in developed nation as well. South Korea is also turning out to be a juggermout in steel, petrochemical and ship building. However the bank and telecommunication service providers are yet to taste success even at home. Taiwan is yet to build a home grown global brand. Among the two bright spots in Europe are Poland and Czech republic. Poland has the distinction of only economy in Europe whose status quo remain unchanged during 2008 crisis. It’s a vibrant market , which is creating jobs at a rapid pace, so much so that a lot of immigrant Poles are returning homes. Czech republic suffered but recovered quickly. Both these nations exhibited commendable budget disciplines and are now debt free. They have become magnets for capital inflows. Surprisingly no caution has been given. Brazil is the top exporter of every commodity that has seen dizzying price rise like iron-ore , sugar and soybean. These are turning out to be a golden age for the nation. However, the major deterrent in Brazil progress are aging factories and potholed roads. Supply chain is not able to match , thereby increasing the prices. Russian President Vladimir Putin too got some basics on track that gave a fillip to the consumer boon. He pushed some key reforms like consolidating banks, cutting down on red tape for starting business and reducing personal income tax rates. An account for ominous time, called oil stabilization fund was started to save oil profits. However, Like Brazil, Russia too is putting less into roads and infrastructure. Despite privatization, government still holds at least 51% stake in each company. In other words, government still controls the company. Malaysia has a vibrant economy but it is heavily dependent on export of palm oil and rubber plantation. Mexico has a hottest stock market but a sluggish economy. Top ten business families are controlling almost every industry. There are some obscure nations which can see explosive growth over the next decade. Settings few things right can set the economies on motion. Internal scuffle effected nations like Sri Lanka and Kenya can unleash growth. These are called frontier nation where world is likely to see explosive growth over the coming decade. These countries have not yet aclamatized itself with global trade and flow of money. Stock market growth is still in rudimentary stage or not evolved yet. Also included in the list are countries like Nigeria, Uganda and Mozambique. One of the talking point is Angola, who though does not fits into definition of Frontier market but have been planning of opening a market for quite some time. If it does, there will be huge investor response as its 2nd largest oil producer in Africa. The author observation,conclusion and forecasts are based on facts, trends and pattern. He has emphasized in the beginning itself that its difficult to pin point the reasons for a nation’s growth or lack of it. There is no magic formula. The desirable measures are free market,savings, ability of banks to funnel money into productive investments, enforcing rule of law, protecting property rights, low budget, checking inflation and opening door to foreign capitals. These are the bedrocks on which an economy rises. India even though considered among major economies have been omitted from the review because most are familiar with the development and also to save space. Otherwise, an entire chapter has been devoted to India.